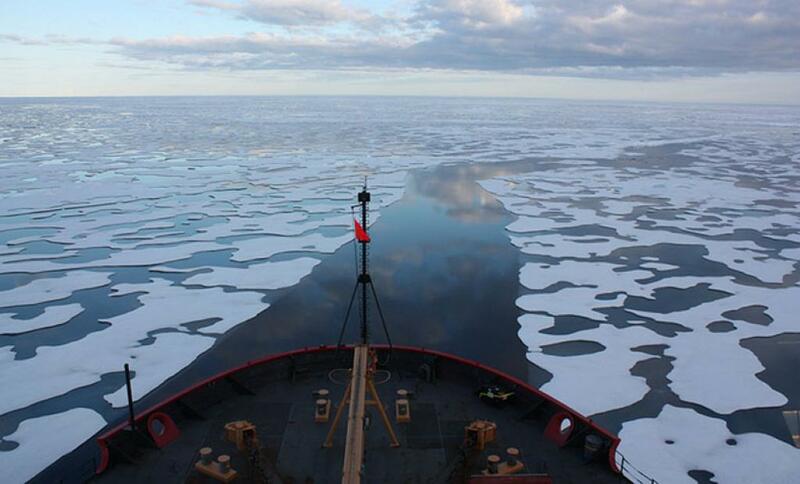 The Arctic Ocean could be ice-free sooner than what most of the scientific studies have predicted so far. A new study led by the University of Calgary’s Cryosphere Climate Research Group claims that satellite data for the thickness of seasonal ice (one-year-old ice) have been overestimated by up to 25 per cent. The study attributes this inaccuracy of satellite readings to the saline properties of snow cover on top of the ice. “The problem is, microwave measurements from satellites don’t penetrate the salty snow very well, so the satellite is not measuring the proper sea ice freeboard and the satellite readings overestimate the thickness of the ice,” says Vishnu Nandan, Geography Eyes High doctoral candidate and lead author of the study. All this while, all the scientific estimates on sea ice thickness and volume have been made based on the data provided by the European Space Agency’s CryoSat-2 (CS-2) satellite, considering that the satellite can accurately measure the sea ice freeboard, which is the ice we can see above sea level. “But that ice is covered in snow and the snow is salty close to where the sea ice surface is,” adds Nandan. The study concludes that the “snow cover on sea ice affects the CS-2 radar waves” and it has the potential to misrepresent the sea ice freeboard, leading to ambiguous sea ice thickness estimates”. 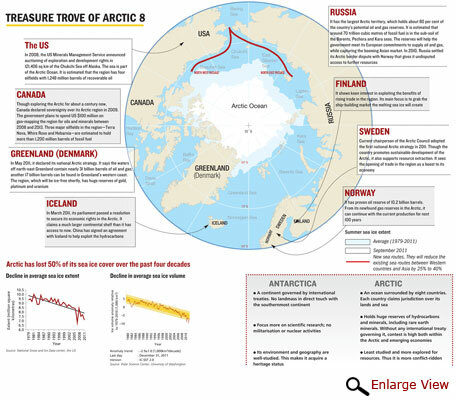 Questioning measurements provided over the past decade by the CryoSat-2 means the first ice-free summer in the Arctic Ocean may happen much sooner than between 2040 and 2050 as predicted by previous studies. Previous studies had pointed to shorter sea ice season with total number of ice-covered days declining by seven to 19 days per decade in the last 35 years. 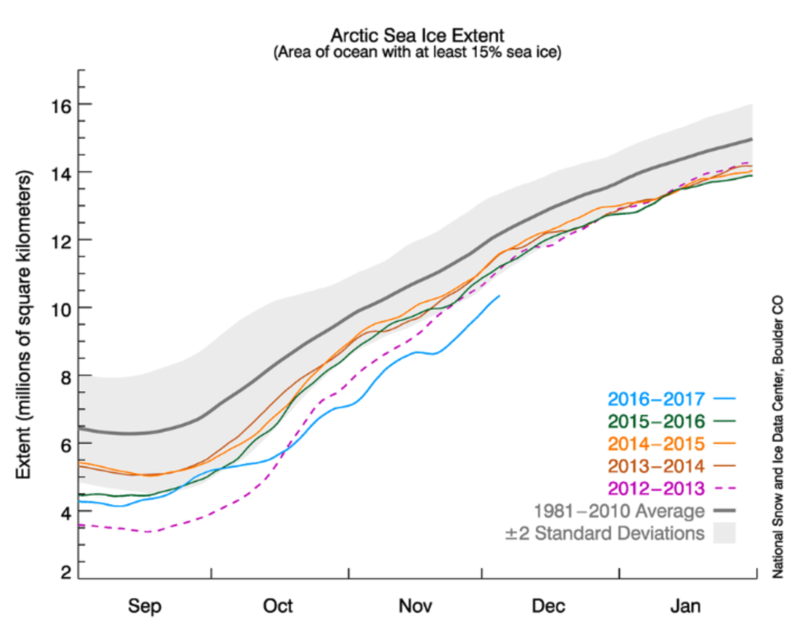 In fact, in March 2017, the Arctic Sea ice extent dipped to a record low. To offset the inaccuracy of satellite readings, Nandan and his co-researchers from University of Calgary as well as researchers from Toronto, Germany and France examined the role of saline snow on first-year sea ice (FYI), with respect to its ability to decrease radar penetration depth and its impact on FYI thickness estimates. For this, they combined microwave theory and over 10 years of snow property data in the Canadian Arctic. Prior to this study, it was believed that the volume of ice has been declining by 17 per cent every decade since 1979. The new research shows that the rate of summer sea ice decline could be slightly faster. Ice-free summers in the Arctic Ocean “would radically affect global weather patterns and dramatically increase the magnitude and frequency of storm events. 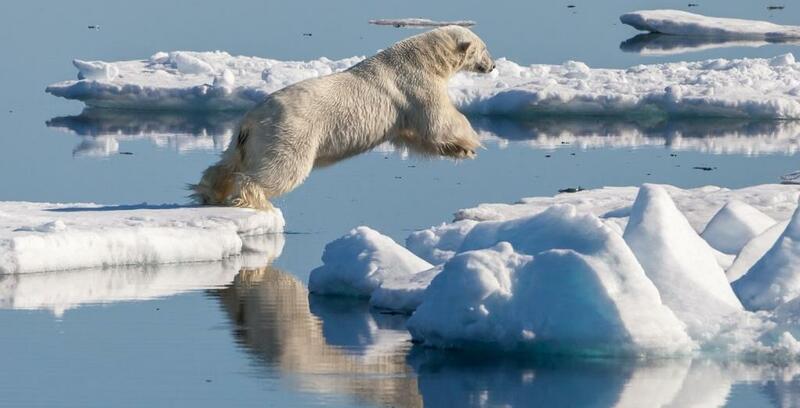 It would also dramatically alter the Arctic marine ecosystem, with the added sunlight affecting the Arctic Ocean food web and melting the very ice bed on which animals like polar bears hunt,” says John Yackel, professor of geography, University of Calgary. The study recommends considering snow salinity in all future estimates on the Arctic seasonal ice freeboard made from satellites. To put it simply, the record November-December temperatures in the Arctic do not happen in the simulations that leave out human-driven climate factors. 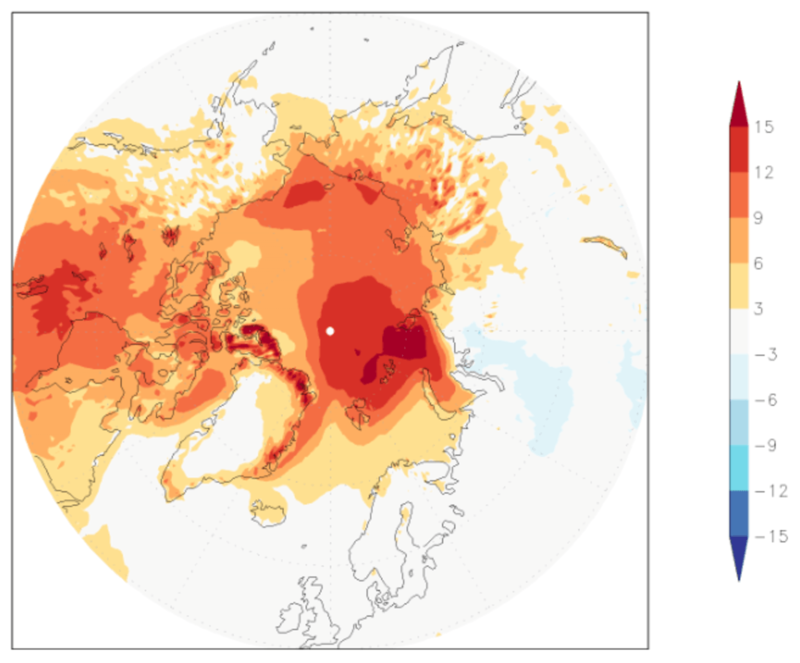 In fact, even with human effects included, the models suggest that this Arctic hot spell is a 1-in-200-year event. 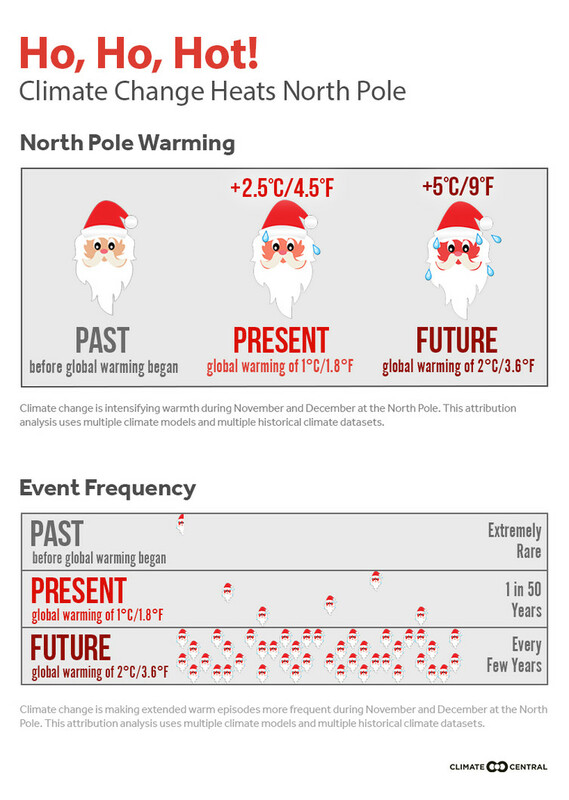 So this is a freak event even by the standards of today’s world, which humans have warmed by roughly 1? on average since pre-industrial times.